Hey guys, so it's time for another OOTD! I went out to the pub for a few drinks last night and wanted to share with you guys my new love. 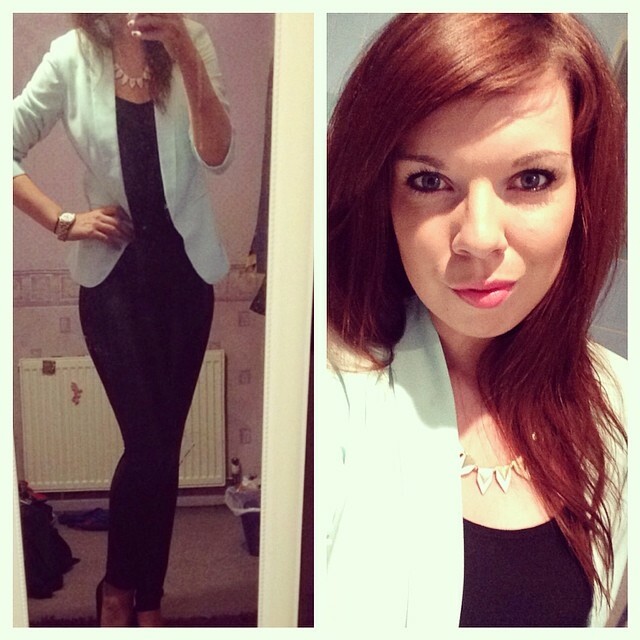 The mint blazer! I bought this from new look costing around £24.99. This is the perfect colour to wear in spring/summer and I feel like it makes even pale people like me look a little glowy and tanned. I wore black Disco Pants, a black swing top with crochet detail at the bottom and black wedges to combo with the blazer. Makeup wise I had to do a day to night style makeup because I had to rush from work. I wore MAC Studio Sculpt, MAC Mineralized skin finish, Rimmel Bronzer, black eyeliner, The Naked pallette eyeshadows etc. etc. This look is fab! I also have that necklace and I think its great! If you could check my blog out and give me some advice, that would be fabulous! Been looking for a good blazer - might have to check this one out!